Loch Assynt is framed by mountains made up mostly of red-brown sandstones belonging to the Torridon Group, deposited about 1000 million years ago. They were laid down by vast river systems flowing out of mountainous country that once existed to the north-west, and they buried a landscape of hills and valleys cut in the Lewisian Gneiss. View southwards across Loch Assynt towards Beinn Gharbh. 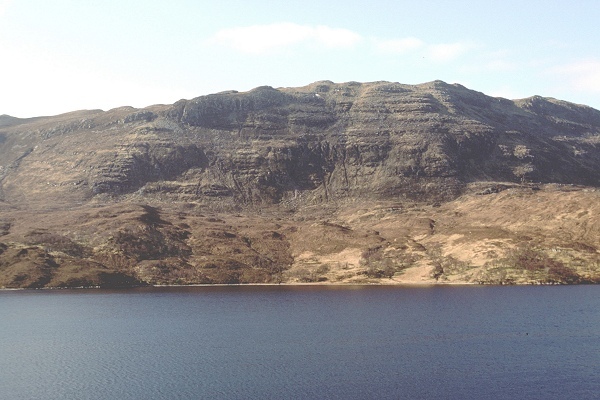 The brown hummocky ground on the lower slopes is underlain by Lewisian gneiss, and the steep face of the mountain is made up of horizontally-bedded Torridonian sandstones. This view shows that the sandstones were laid down on an uneven surface of gneiss. The contact between the sandstone and gneiss lies at a lower level in the centre of the photo than at the right-hand side (try following one of the lower bands of sandstone to the right: it will meet the gneiss "hill"). Also visible in this view is the capping of Cambrian quartzite on the left, near the top of the ridge. It dips gently to the east (left), cutting across the bedding in the older Torridonian sandstones. A view of the sequence of rocks on the north shore of Loch Assynt. 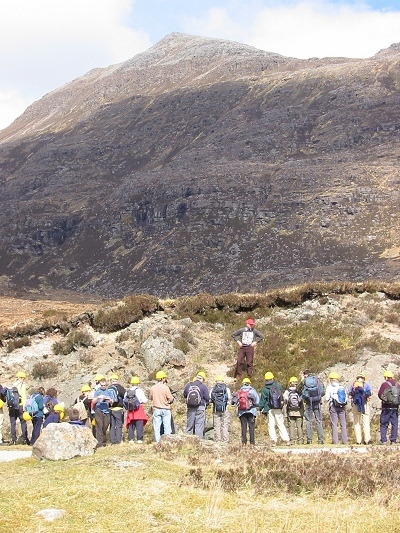 A party of students examines a roadside outcrop of Lewisian gneiss. Beyond them, the mountainside is made of horizontally-bedded Torridonian sandstone. At the summit, however, the distinctly lighter-coloured rock is the overlying Cambrian basal quartzite. 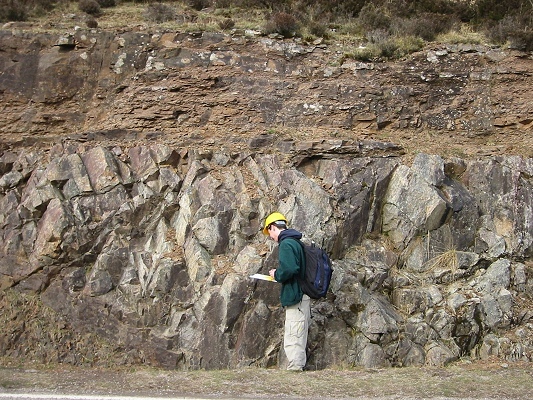 An exposure of the unconformity between flat-lying Torridonian sandstones (above) and Lewisian gneiss with a steeply-dipping layering (below). Angular unconformities occur where older rocks are tilted, uplifted and eroded to a flat surface before younger strata are laid on top of them. In this area there is another angular unconformity in addition to this one, because the Torridonian itself was tilted and eroded before the deposition of the Cambrian quartzites. 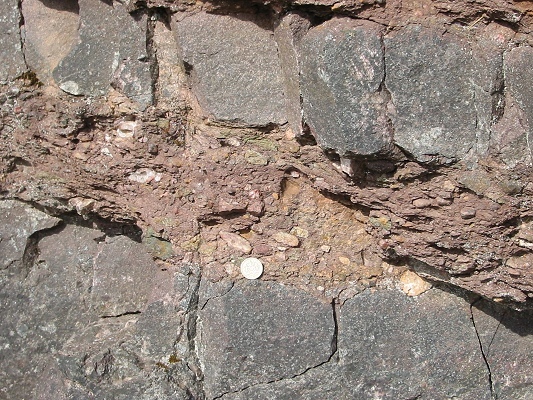 Detail of coarse and pebbly Torridonian sandstones immediately above the unconformity. The even-grained coarse sandstone (top and bottom) is well cemented, and fractures into angular blocks. The pebbly sandstone, however, is relatively soft and friable, even after 1000 million years! The coin is about 2.5 cm in diameter.